On Sunday, 13 May, South Africans stop working for the state and start working for themselves. 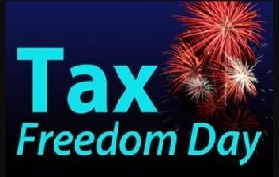 Sunday, 13 May, is Tax Freedom Day and this year it falls 2 days earlier than last year. To put this into greater perspective, back in 1994, it took 101 days to pay for government before South Africans could start earning for themselves. It now takes 133 days – over a month more – and for the state to help itself to more than half of the economic growth since 1994. Tax Freedom Day is calculated by dividing General Government Revenue by GDP at market prices then multiplying the result by the number of days in a year, and finally adding a day. General Government Revenue doesn’t include the revenue of public enterprises such as Eskom, Telkom, etc. Two years ago, there were no fewer than 717 State Owned Enterprises (SOEs) with total assets of R1 trillion, or 27% of GDP, and government investment amounting to more than 30% of our total investment. If we were to consider this as government revenue, then Tax Freedom Day would be yet another month later, on 16 June i.e. total government revenue is really some 45.25% of the entire economy. That is exceptionally high by international standards. For our level of economic development, it is very near the highest. That Tax Freedom Day is a tiny bit earlier this year is not due to the good intentions of government but rather to a struggling economy and the squeeze on the profits and consumption on which taxes depend. The long-term trend is toward increasingly later Tax Freedom Days and considering the most recent budget speech this trend is likely to continue. This is a concern for several reasons. Firstly, South Africa desperately needs faster economic growth. Large tax burdens and high fractions of the economy under SOEs are independently associated with slower growth in international studies. What we might call return on investment in government is lower than it is in the private sector because government is less innovative, less efficient and misallocates resources. Therefore, shifting resource allocation from private enterprise to government slows down growth. Secondly an increase in government power relative to civil society threatens the freedom that was so hard won in the struggle against apartheid. Thirdly corruption is mostly a function of opportunity, so putting more resources and funds in the hands of government promises more corruption, which, I think we all agree, is already very bad.